Access Control Bay Area strive for exceptional customer service, industry expertise, and fast, efficient service. As a business owner you have a lot on the go, which means the less you have to worry about the better. The last thing you probably think about is the people coming and going from your building. Both your busy schedule and long employee list make it difficult to oversee who is welcome in your building and who is not. That’s where Access Control comes in. By restricting building access through cards, tags, or fobs only those with permission can enter the premises. For every business looking to enhance building security and workplace safety an Access Control System is the solution. What makes it better than lock and key? In general, Access Control gives you total control over when and where people can enter the building. If a key goes missing the cost of replacing multiple locks is expensive. However, with fobs, cards and tags this is no longer a problem; simply disable the lost entry device and program a replacement. Worried about key duplication? Uniquely programmed entry devices make this impossible. In addition, the system enables you to schedule employee entry time. You can’t control entry time with a regular key, but door access enables total control over when a card holder can enter or exit the building. As well, the system compiles permanent records that account for when something happened and who was present. Lastly, another solution is the system’s ability to give instant alerts as events take place in real-time. For many shared and multi-tenant facilities, public access to each floor of a building is not suitable. For this reason, added features such as, “Elevator Control” restrict cardholders to certain floors within the building. Just when you thought it couldn’t get any better, it does: you can control the above security solutions from the palm of your hand. Yes, that’s right; access to the entire system is available via smartphones and tablets. The relief that comes from knowing the people within your building are safe is invaluable. Abilities such as staff monitoring reinforce existing security systems so your mind can rest easy. 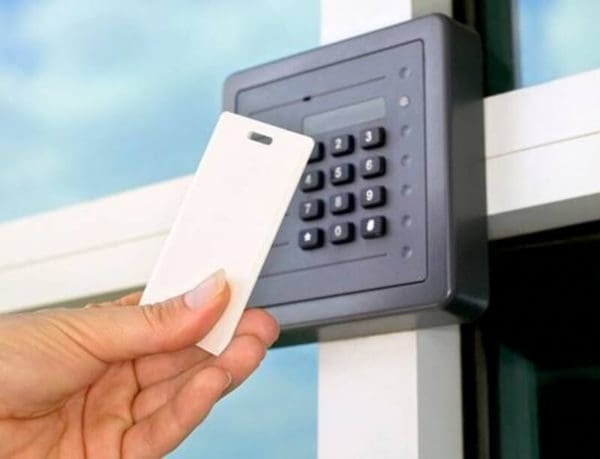 The large variety of Access Control systems available, from single door audio door entry to computer based systems with biometric readers mean you can customize the system to meet all of your security needs. A complete and reliable Access Control system is an essential add-on for your business security system. Is the safety of your work facility important to you? If yes, please feel free to visit our website to learn more about Access Control systems.